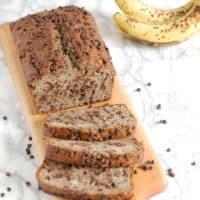 Buckwheat Chocolate Chip Banana Bread is made with buckwheat flour, Greek yogurt and those over-ripe bananas you probably have sitting on your kitchen counter. 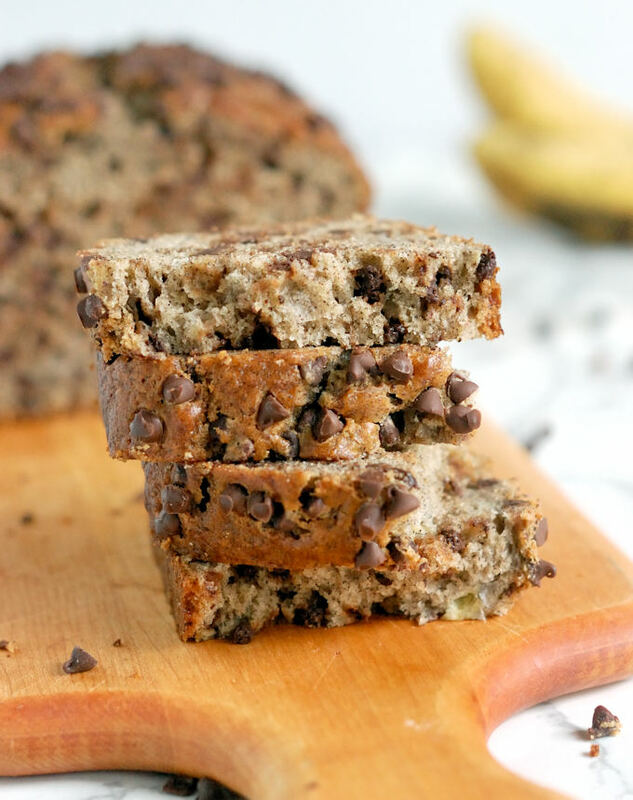 This lightly sweet and hearty banana bread is great for breakfast or brunch. 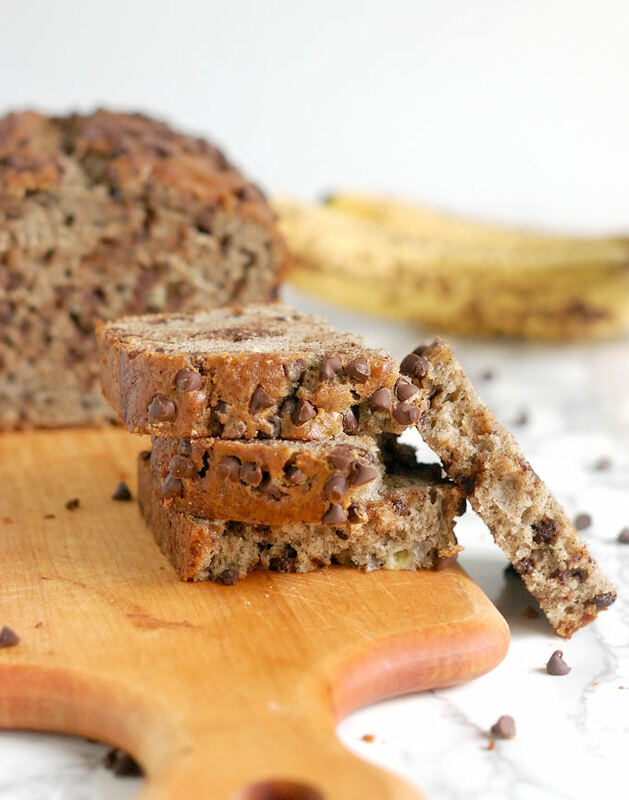 I know you probably already have a favorite go-to banana bread recipe. 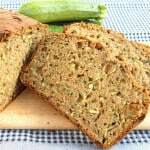 But, if you don’t already have a favorite recipe, or if you’re looking to try something different from your usual, I’m offering my contribution to the infinite number of banana bread recipes on the inter-webs. 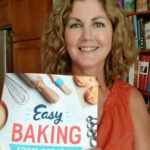 I’m not a huge fan of quick breads & muffins that are super sweet and fluffy. If I want cake, I’ll make cake. I don’t want a muffin that is pretty much just a cupcake under another name. I tend to like muffins and quick breads that are slightly less sweet and have some texture to them. I wanted to make a banana bread that I’d want to eat for breakfast, not for dessert. There is sugar in the recipe, but it’s reduced a bit. 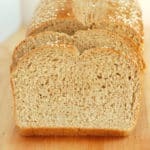 I decided to add a little non-white flour to the mix to give the bread an interesting texture. 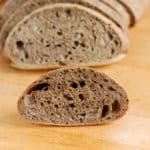 I choose to use buckwheat flour because, well, I had some in the pantry – and also because I like the specific color and flavor that buckwheat brings to a recipe. We always have Greek yogurt (my usual breakfast) in the house, so I used it instead of buttermilk or sour cream as the liquid in the recipe. I’ve been playing with Greek yogurt in breads and really like the plush texture that comes from the thick and luscious yogurt. You could use regular yogurt instead. The batter will be a little looser since American yogurt is thinner than Greek yogurt. 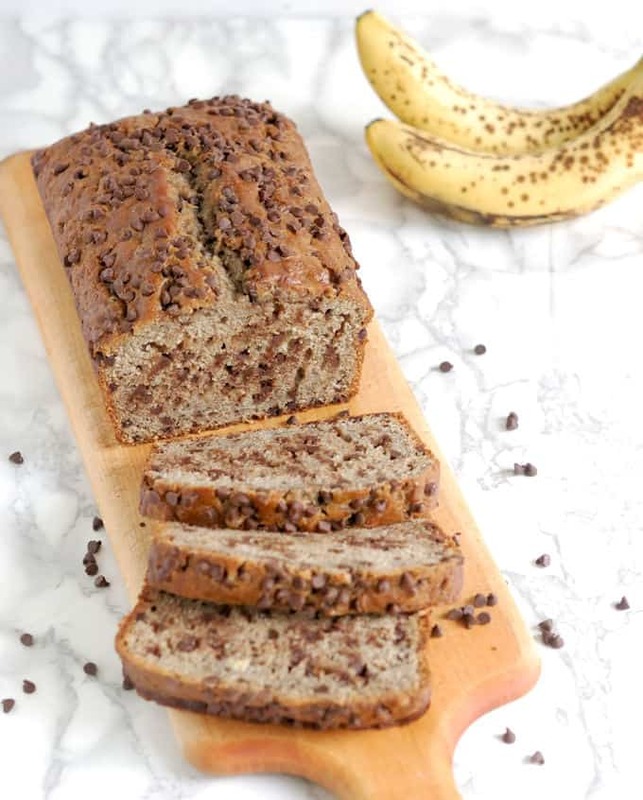 I’m sure you already know that slightly over-ripe bananas are best for baking. As bananas ripen they become softer and sweeter as the starches turn to sugar. 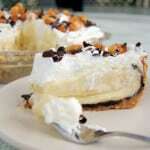 I like to bake with bananas like you see in the photos; well-speckled, but not black and mushy. 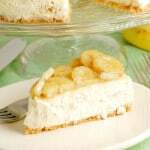 A hint of cinnamon & nutmeg, along with a splash of lemon extract, brings out the flavor of the bananas. 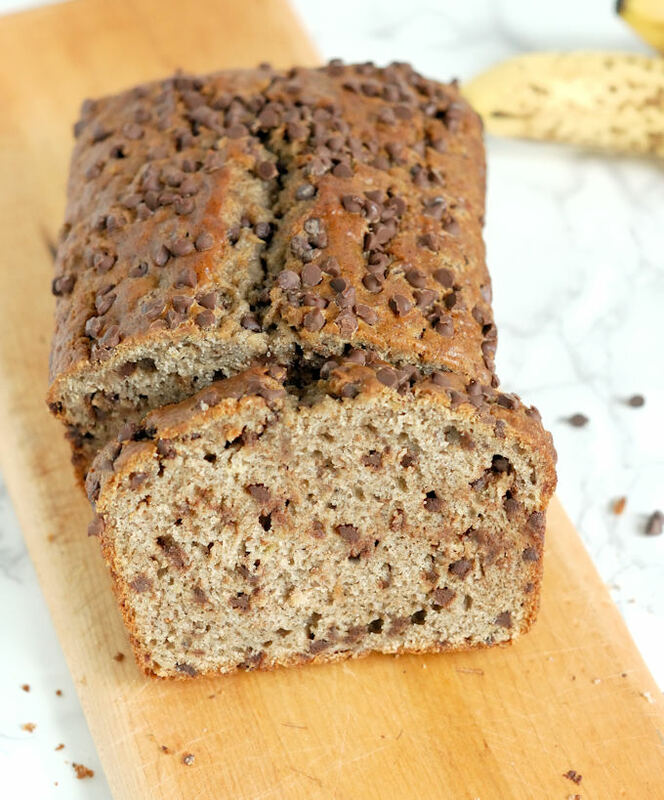 Watch the recipe video to see how easy it is to make Buckwheat Chocolate Chip Banana Bread. 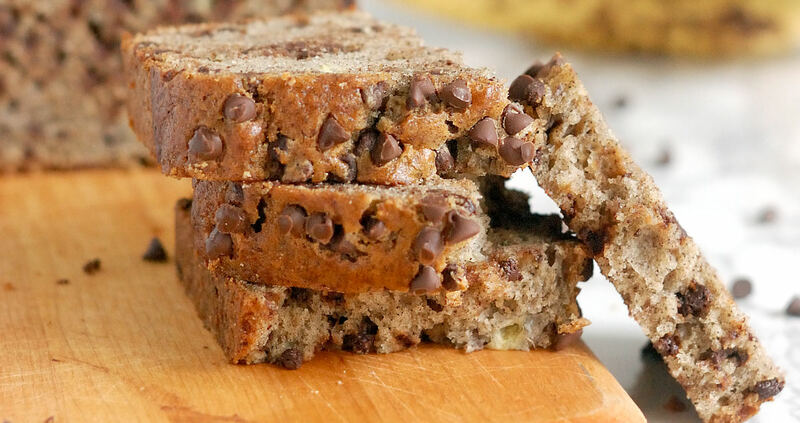 Moist and delicious banana bread made with buckwheat flour and chocolate chips. Preheat the oven to 350°F. Butter and flour (or butter and line with parchment) a 9"x 5" inch loaf pan. Mash bananas with a fork, leaving them a little chunky. Add yogurt, oil, melted butter, eggs, vanilla and lemon extract to the bananas. Mix to combine and set aside. Toss the chocolate chips with 2 teaspoons of water to moisten. Sprinkle a teaspoon of all purpose flour over the chips and toss, set aside. Combine flours, sugar, baking powder, baking soda, salt, and spices in a large bowl. Whisk the dry ingredients to combine. Add the banana mixture and stir until about 2/3 of the flour is incorporated. Fold in the chocolate chips and mix until all the flour is incorporated. Pour the batter into the prepared pan. Sprinkle additional chocolate chips on top if you'd like. Bake until golden brown and a toothpick inserted in the middle comes out clean, about 50-60 minutes. Cool for 10 minutes in the pan, then turn out onto a cooling rack to finish cooling. Tossing the chocolate chips with flour and water creates a paste on the chips that helps keep them suspended in the batter. 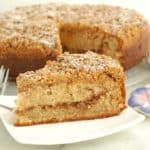 The cake will keep for several days at room temperature or can be frozen. 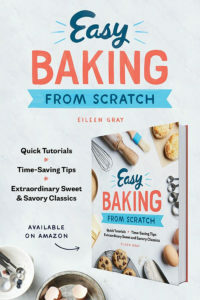 The batter can also be baked as muffins.